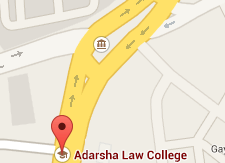 Adarsha Law College sponsored by Sagar Education Society was established in the year 1994. Since then, it stood as a pioneer of value based legal education in the Telangana region. This college is affiliated to Kakatiya University Warangal and permitted by Bar Council of India, New Delhi. This is the only private Law college under Kakatiya University which has been offering LL.B 5 Years Degree course since its inception. It is the only private Law college which also offering LL.M in two streams i.e. Corporate Laws and Intellectual Property Rights, Several hundred law graduates from this institution have entered the legal profession. Several students from this institution have become Junior Civil Judges and Public Prosecutors. Alumni of this college is spreaded all over the state and a good number of Law Graduates went abroad for higher studies and some of them settled in legal profession abroad. Many private banking organizations have the alumni of this college as their legal advisers. This college has its own premises at Hanamkonda in the center of Historic city Warangal in Telangana State. It has a good number of Permanent Lecturers who are well qualified, experienced and committed. This College always lay emphasis on practical training and permanent Moot-Court hall was set up in this college. Court visits and instructions by senior advocates are made part of the academic routine. The students of this college have been proving their excellence by winning Gold Medals regularly at the University Level in the examinations.